This web site used to be hosted at www.stamp.demon.co.uk but I have finally splashed out on a domain name (oh, the expense) and relocated to here - www.underprints.com. Please update any bookmarks or links you might have had to the old address as it will disappear totally in the near future and www.underprints.com will be the only source for this information. The main reason for the move was the lack of "free" space via my old ISP - just 20MB. This severely limited the number and quality of stamp images I could have on the site. My plan is to, over time, redo the existing lower quality scans and add images for other items I wasn't able to show before. 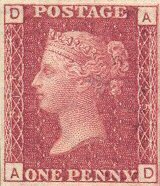 The main purpose of this web site is to allow me to publish my research into areas of philately that interest me (Protective Overprints and Underprints, Perfins, Adverts on Stamps, etc.) and to enable other people to feed back comments, suggestions and any useful information they may have on the subjects covered. By the very nature of the information held here the web site will never be finished. The plan is to update the site as often as required to ensure that the information is as accurate as possible.